In the interest of debunking the myth that high yields mean unsafe investments, here are three high-yielders that do a great job of managing risk while producing excellent income. I was recently having a discussion with a friend about retirement strategies, and the topic of our "numbers" came up -- that is to say, the amount of money that we would need to retire completely comfortably. I said that I would want $1 million, and I justified this by explaining that I could extract $100,000 in annual income (pre-tax) in perpetuity, to which he responded that there is absolutely no way to earn 10% returns safely in today's market. Well, I obviously disagree. While it is true that high-yielders generally come with more risk than blue-chip stocks, the notion that all high yielders are dangerous is just plain wrong. Here is a list of three stocks and funds that all have high yields and are of reasonably low risk to make up a part of anyone's income portfolio. The first example is the Eaton Vance Tax-Managed Global Buy-Write Opportunities Fund (NYSE:ETW), which currently yields 9.7% annually, and pays distributions every month. While this is a bit shy of the 10% figure I mentioned earlier, I love this fund for a few reasons. First off, it's cheap. The fund trades for about 7.5% less than its net asset value (NAV), which is the sum of the fund's assets minus its liabilities. So, in other words, you can buy a fund that is worth $13 per share for about $12 per share. Second, it has a good track record of performance, having returned an average of 16% annually over the past five years, including both distributions and price appreciation. Finally, I just love what this fund does, employing one of my favorite income strategies and saves me the work of actually doing it: investing in a diverse stock portfolio consisting of solid and often undervalued companies. Its top three holdings are Apple, Google, and Microsoft, and no single stock accounts for more than 4.3% of the portfolio. The fund managers then write covered call options on the portfolio to generate income from its holdings, and pass the profits to the shareholders. Another great choice is the Wells Fargo Advantage Global Dividend Opportunity Fund (NYSE:EOD), which pays out a 9.5% yield with quarterly payments. This fund invests in global stocks that pay solid dividends and have a high probability of increasing those dividends over time. In addition, the fund also employs some options strategies in order to achieve its income objectives. The portfolio is very diverse (meaning that it's safe) with 102 different stock holdings, and is heavily weighted in the utilities, financials, and communications sectors. Of course, no discussion of high-yielders would be complete without mentioning the mortgage REITs. Now, although these companies all pay relatively high dividends, not all are created equal. Some use much higher leverage than others and employ more aggressive strategies to maximize their income. However, our purpose here is to maximize our income in a relatively safe manner. With this in mind, even though it is the biggest and most widely covered, Annaly Capital Management (NYSE:NLY) truly is the best in breed. 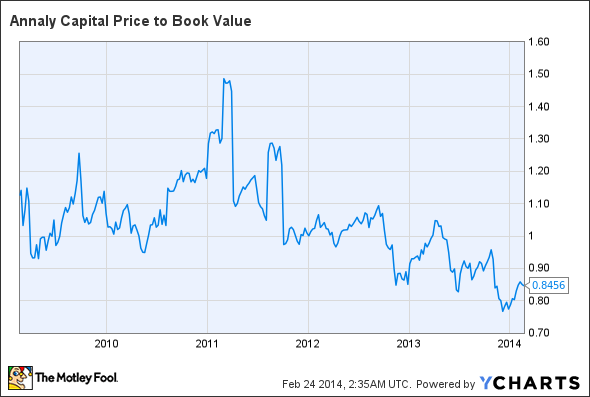 The company is trading at a substantial discount to its book value, especially when looking at its historic valuation. NLY Price to Book Value data by YCharts. Annaly currently yields about 11.2%, which is actually relatively low in the mREIT sector. The company's profits (and share price) have dropped recently as spiking interest rates have cut into the spreads that Annaly makes its money from. Fortunately, Annaly's management had the foresight to reduce the amount of leverage it had been using. Although that eats into current earnings a bit, it allows the company to pounce on profitable opportunities as they come up. Now that the Federal Reserve has begun (and stuck with) its long-awaited taper, it has provided some direction and stability to interest rates, which is what companies like Annaly need in order to thrive. With the uncertainty in the Fed's monetary policy is behind us, we should see relatively stable rates going forward. Annaly has historically averaged around a 12% dividend yield, and the lower current yield is most likely due to the lowering of leverage. In addition, investors are likely uncertain about Annaly's next dividend payment. It will most likely be either $0.30 or $0.35 per share, and the former would translate to a $10 share price at 12%, and the latter would mean $11.67. Currently, the price is right in the middle of the two. This is by no means an exhaustive list -- there's a long list of stocks and funds with high yields. These are just a few that do a great job of managing their risk which producing high levels of income for shareholders.